NEW YORK—Sun rays were glittering on the polished brass instruments as a 120-strong marching band made its way through Flushing, Queens, on Saturday noon. Tailing the band, a lively dragon dance troupe swirled around followed by a neat lineup of a dozen ladies in ornate traditional dresses in the Tang Dynasty style. There was a special significance to the parade happening on April 25, explained Sang Yuan, 29, who hails from Shandong Province in eastern China. In 1999 Sang was in eighth grade and in her spare time practiced Falun Gong (also known as Falun Dafa), a spiritual discipline consisting of meditative exercises and moral teachings. After Falun Gong’s introduction to the public in 1992, the Chinese regime had promoted it for its health benefits. But as the number of practitioners reached tens of millions, even surpassing the membership of the Communist Party, the regime’s attitude turned sour. On several occasions practitioners had experienced harassment by the authorities. But on April 23 in Tianjin, a city about 90 miles south of Beijing, the harassment escalated. Some 40 Falun Gong practitioners had been beaten and arrested. When practitioners sought the release of those arrested, police told them this matter had to be handled by authorities in Beijing. Thus, on April 25, some 10,000 others made the trip to reach the Central Appeals Office, where Chinese have the right to petition the state. But they never made it to the office. Instead police directed them to nearby streets around the most sensitive real estate in China, the Chinese Communist Party headquarters and leaders’ living quarters known as Zhongnanhai. The practitioners lined up in an orderly fashion on the sidewalks and quietly waited. They held no banners, and shouted no slogans. Later that day China’s premier, Zhu Rongji, walked out of the complex and asked to speak with representatives. The premier promised the detained in Tianjin would be released and offered reassurances that the Party did not oppose Falun Gong. The practitioners then quietly dispersed, even picking up cigarette butts left behind by the police. Ten years after the Tiananmen massacre, it seemed China had moved on and the regime had found a civil way to resolve a conflict. But appearances could be deceptive. Just three months later then Party leader Jiang Zemin launched a nationwide campaign aimed at eradicating Falun Gong. The pictures of the thousands surrounding Zhongnanhai were used to portray Falun Gong practitioners as threatening. The campaign continues today. According to the Falun Dafa Information Center, over 3,800 practitioners have been confirmed as killed by torture and abuse, although it estimates the true number is much higher. Researchers estimate that tens of thousands of practitioners have been murdered by having their organs harvested for transplantation. Still, the April 25 appeal wasn’t in vain. 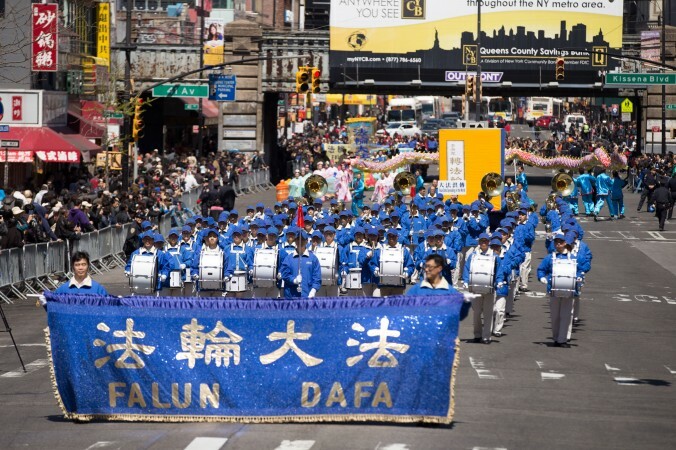 “On April 25, Falun Gong started something that changed the face of China,” said Dr. Damon Noto, a spokesman for Doctors Against Forced Organ Harvesting (DAFOH), a medical ethics advocacy group, during a rally following the parade. “So many people were afraid of the government,” Noto said. But Falun Gong practitioners weren’t afraid. They hoped to change the situation by explaining the facts. And have been doing so ever since. The only difference is they no longer appeal to the regime. Instead, they explain their situation to one person at a time. Just as Sang does. Due to the persecution in China, she immigrated to United States and now lives in Flushing and works as a health care professional. And gradually, Sang’s wish is coming true, according to David Tompkins, one of the parade’s organizers. Over the past few years Tompkins has seen the response from the local community change dramatically. Many Chinese used to only know about Falun Gong from the vilifying articles in China’s state-run press. Now however, many spectators express admiration for Falun Gong’s perseverance and aim their anger at the regime’s malevolence. William Yu, 35, who spoke at the rally in Flushing, used to be an English teacher at a high school in China. Looking back, he said the education he received in China left him brainwashed, believing that China couldn’t exist without the Communist Party. “I eventually became a teacher, where I continued to spread the CCP rubbish,” he said. Then, in 2012, he found Dynaweb, an Internet-based tool to circumvent Internet censorship in China. The first thing he accessed was a video debunking some of the regime’s attacks aimed at Falun Gong. “Nine Commentaries,” a book first published by Chinese-language Epoch Times in 2004 as a series of editorials, offers an uncensored history of the violence, brutality, and lies of the Chinese Communist Party. After reading the book Yu decided to renounce his Party membership. He stopped paying his dues and in 2014 made an online statement severing all ties with the party, thus joining the “Tuidang” movement. Shortly after the “Nine Commentaries” were published, ordinary Chinese began writing Epoch Times saying they wanted to separate themselves from the Party. The Tuidang movement—Tuidang means “quit the Party”—was born. As of April 2015, over 200 million people have published statements through the Tuidang Center renouncing any association with the Communist Party, Young Pioneers, or Communist Youth league, submitting their statements by phone, fax, email, or in person through a volunteer. Though Yu faced discrimination for quitting the Party, including losing his job as a head teacher, he was ultimately able to gain refugee status and about half a year ago immigrated to United States. He said that to speak up against the persecution of Falun Gong is a “test of conscience.” “To speak out against this evil is a sign of conscience, to stay silent is to side with the perpetrators,” Yu said. Epoch Times reporter Larry Ong contributed to this report. Correction: An earlier version of this article said Sang Yuan joined the April 25, 1999 protest at Zhongnanhai. That is incorrect; Sang participated in a September 1999 protest at Tiananmen Square.